As you load up the spoon, you dive for a pleasing combination of flavors and textures, building anticipation for the imagined mouthful. It is not until you start to lift the spoon that you remember this spoonful is destined not for your mouth but for the mouth of the person you are sharing food with. Your attention shifts to her face, and you wonder how she will experience the bite you so carefully arranged on the spoon. You check in with her eyes (Is she ready? ), and lift your spoon to her mouth to carefully deposit your bite. Then it is your turn. Your dining partner arranges a spoonful for you and lifts it toward you. You have a flash of anxiety (Will the spoon hit my teeth?) before summoning the courage to open your mouth to take the offering. There is a crossing of boundaries here, an opening not only of your mouth but also of your personal space. Designing and making ceramics that people use to feed each other is a way for me to use material form to explore the boundaries of subjectivity by engaging our sense of self-and-other. Feeding someone cultivates empathy, as our attention focuses on that person rather than on our own satiation. We extrapolate from our experience to imagine what the other feels. We read the face and body for clues - the eyes and the mouth, possibly posture and hand gestures - of when and how much to feed. Being fed cultivates physical and psychological vulnerability, as we reveal our hunger and offer access to our inner lives. During mutual feeding, my pottery forms bridge the space between two subjectivities, each one simultaneously reaching and receiving. It is not often in our culture that we actually feed another person. Our first association with being fed is formed when we are babies, relying on the body of the mother or caregiver for sustenance. There are circumstances when someone becomes unable to feed herself, because of illness, injury, or age. And there are ritualized instances, as in a wedding ceremony or in the sacrament of the Christian Eucharist (although in contemporary settings the Eucharist is sometimes placed in the hands rather than directly in the mouth). There is a nurturing power to the act of feeding. In a wedding, it indicates a circuit of dependence; the Eucharist is one way that a priest offers parishioners a physical experience connecting them to the sacred. We can read the symbolism of ceramic utilitarian ware in a similar way, by examining the latent meanings of those forms within their context of contemporary food culture in the United States. The single-serving mentality behind factory-food production assumes the consumer to be an individual bounded self, separate from other humans and from her food sources. Handmade pottery counters many of the assertions of the larger food culture, but maintains interpersonal individualism on a basic level. At a formal meal, for example, each place setting defines and protects the personal space of one individual. There is a set of dishes and utensils for each guest, and only close friends or intimates will cross that boundary to eat from another's plate. Because utilitarian pottery coalesces out of our historical, cultural, and personal ways of being in the world and relating to others, its forms are imprints of our inner lives, molded by the gestures of the self. In The Meaning of Things, Mihaly Czitzenmihaly notes: "Thus the things that surround us are inseparable from who we are. The material objects we use are not just tools we can pick up and discard at our convenience; they constitute the framework of experience that gives order to our otherwise shapeless selves." The pots that we create and use are mirrors of our subjective space, making tangible our beliefs about the emotional, political, and spiritual significance of food. Our sense of self is composed of shifting metanarratives that we use to make meaning of our lives - our sense of time and of place, of purpose and meaning, of selfhood and community and of emotional experience. As we live, we build and revise these stories, crafting a personal history and subjective space that delimits our self from all that is outside of it. Paradoxically, we also intuit an inherence of self-in-world that implies reciprocity of body and environment, and of self and other selves. The paradox of autonomy versus connectedness is part of the human existential condition. We are bounded entities, but that boundary is permeable and dynamic rather than static and rigid. The daily passage of food and drink from the external to the internal world is one physical manifestation of that permeability. We choose foods to become our body based on how we understand our existence in the world. Potters know the power of making objects that animate that crossing of matter from world into body. What can be more intimate than the mug whose materiality transports us through the mists between sleeping and waking? The design of objects that suit the gestures of feeding someone will differ from that of objects for use in feeding oneself. 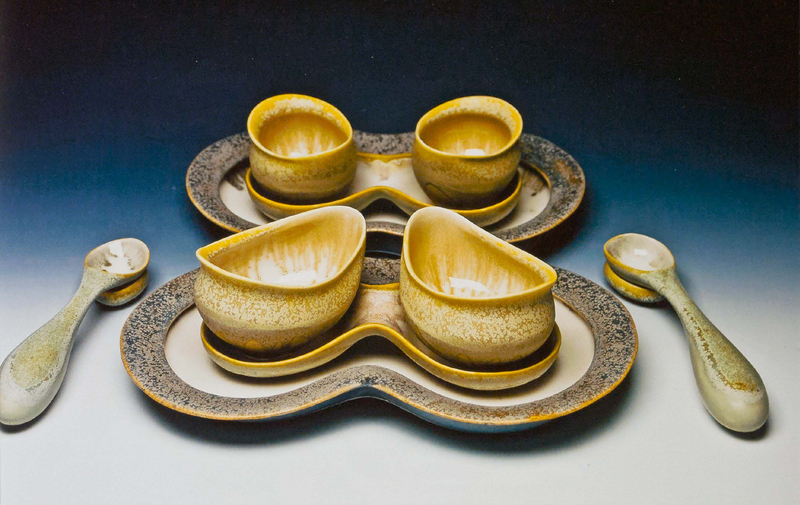 Pouring bowls, with a good grip for the hand, may have spouts that curve to the left or right to direct liquid towards someone seated at one's side. They may have a covered spout, so that they can be used to feed someone who is reclining. Feeding utensils, such as spoons, have to be trusted to enter the mouth gently. Mouth-spoon interaction is a highly charged moment, with tongue and lips cushioning and guiding the spoon into the mouth and delicately cleaning its surfaces on the way out. A spoon designed for pouring or sipping is different from one designed to lift stew. In each of these considerations, I find evidence that the context of use needs to be clarified simultaneously with the creation of the forms. I've resolved that context to be a food event with a specific number of participants, a plan for the foods to be served, and an architecture of the space that supports interactions and gestures. Using the design elements of pots, food, and situation, I compose a multisensory food event, which I consider to be a form of experiential art. I perform the action of cooking and presenting the food on a setting staged by my vision, but the focus is really the interaction of the people with the objects and with each other. Through my presence as server, the experience-is personalized into a conversation. Participants' responses and affective states become accessible to me in a way that is not often captured when objects are viewed in a gallery setting. The artwork dematerializes as participants' attention drifts from object to subjective experience, to the food, and to the person they are paired with. "The experience was very humbling to me. I felt empowered by the surrender with which J. responded, but at the same time very responsible, in that J. was depending on me to respond to him appropriately... The experience is one that fosters trust... I could also focus on the food more because I wasn't automatically placing another spoonful into my mouth. The meal was a thoughtful one..."
"It was like feeding a little bird or rabbit that's almost dying I was trying too hard to find the other's rhythm and timing. However, I realized that it was much easier to not try too hard. When I started to relax and go with the flow, things became more smooth and comfortable." "It makes me think of the closeness people feel towards one another after experiencing a shared traumatic experience (Not that this was a traumatic experience, but it definitely pulled you out of your comfort zone both physically and psychologically). Our usual boundaries are crossed, changing how we might relate/communicate with those who experienced the event with us." 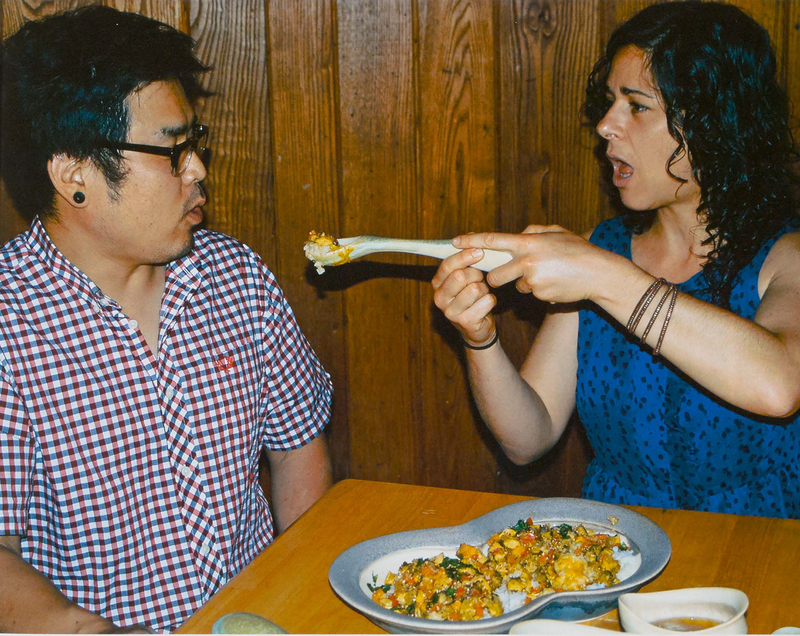 Usually when we are eating a meal with someone, we put food into our own mouth, and our proprioception and interoception guide our movements and timing. Entering another's personal space is more awkward, as one has to infer what is desired by the expressions and response of the other. A person's comfort zone is defined by her personal space, and receiving another's gestures in the openings to interiority, especially in the mouth but also by the eyes, may feel risky and uncomfortable. "The eyes and the mouth are openings into fathomlessness - the interior stripped of appearances." 3 Boundaries are crossed here both by the food entering the body and by the other person's attention and gestures entering one's space. In feedback, a solo exhibition and food event I orchestrated at Ohio University's Trisolini Gallery, some surprising insights into the haptic experience of mutual feeding emerged. On entering the gallery space, each participant was handed a spoon and instructed not to place food in her mouth (the only alternative for eating was to use the spoon in feeding another). Volunteers in the back of the gallery collected used spoons to wash and sanitize in a hot water bath. As the spoons came out of the bath to be used again, people exclaimed at the sensuality of having a warm spoon in hand; it made the spoon believable as an extension of the body. This setting was more informal than feed/feel, because people were strolling around the gallery and eating standing up. It was common for a feeder to touch the one being fed: putting a hand on the shoulder, for instance. Besides stabilizing the other person's body and communicating care, this touch allowed the feeder to sense the response of the one being fed, completing a circuit. At each of my food events, there have been people who will not let themselves be fed. 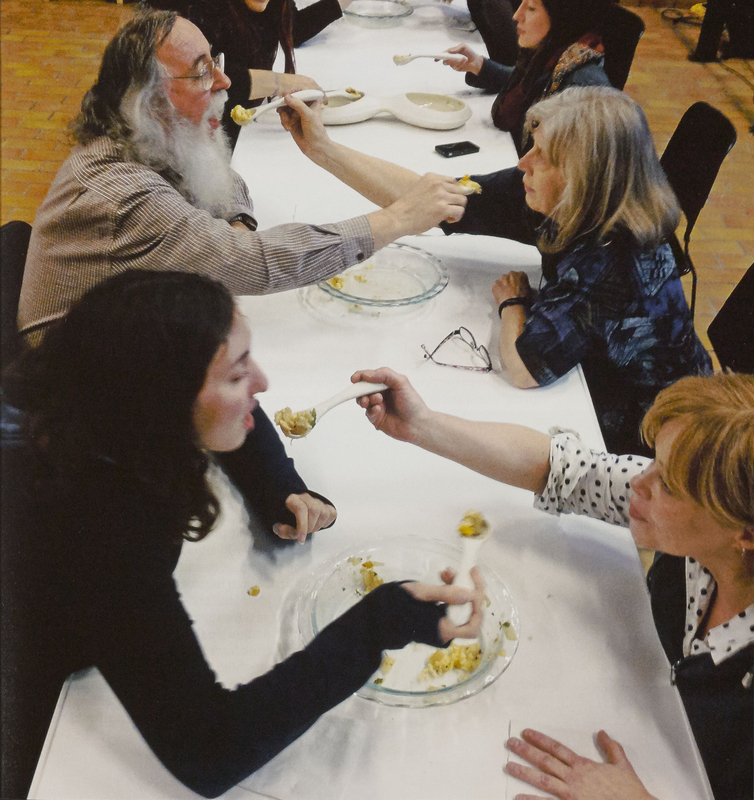 The event at the Alberta College of Art and Design was perhaps most successful as a great equalizer, as professors fed and were fed by their students and strangers interacted by putting food into each other's mouths. One person remarked that she would like to be paired with someone for daily feeding meals over the course of a few weeks, so that she could build a complete sense of the other person's preferences and desires, honing her skills as a personal feeder. She wanted to be accurate in her empathy rather than project her assumptions onto the other. That accuracy, as this person realized, is something that must be cultivated through relationship. It requires committed attention to the other's hunger, desire, timing, preferences, and taste. 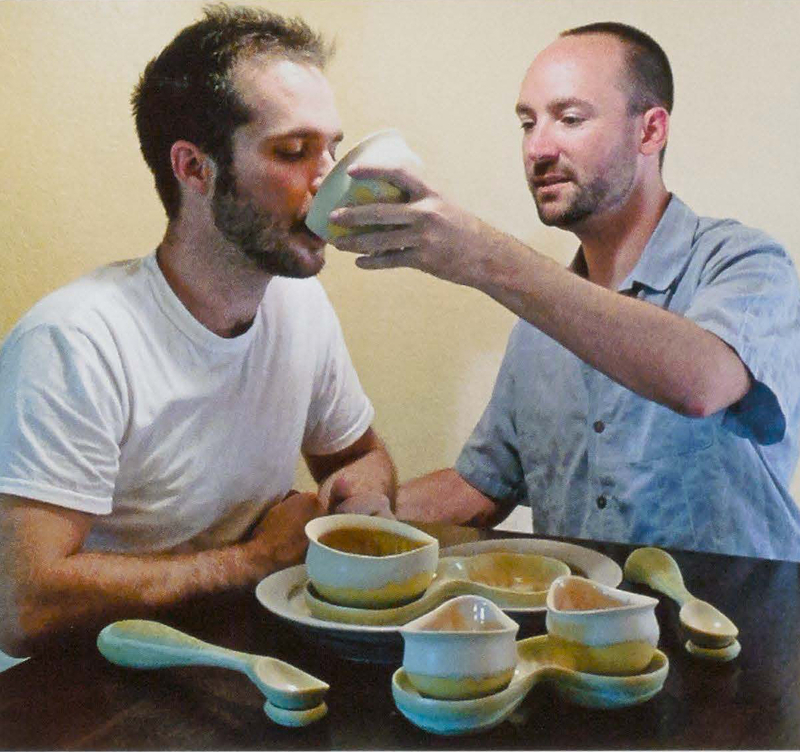 Serving as an alternative to exhibiting in a gallery, a food event using handmade pottery offers a multisensory experience that engages participants in a holistic way. The visual experience of the objects is put into its place, so to speak. In fact, the objects should almost disappear, as people focus on the meaning and significance of their experiences. The material encounter is a mediation of the fluid boundary of subjective space. After each of these feeding events, I have changed the design of the dishes and utensils, according to the feedback I received and considerations of a new site and food plans. I still aspire to design a utensil that disappears in the hand, fits the gesture of feeding, and feels safe in the mouth of the fed. I am excited to evolve my practice for new settings and communities, as I continue to explore the connections among food, pottery, and personal relationships. I imagine, for example, a dinner that would pair members of two community groups who needed to come to a greater understanding of each other. Perhaps each group could serve a different symbolic or ethnic food to the other. I think of involving health care workers in the design of feeding utensils for the people they serve. I wonder what it would be like to collaborate with local food growers and producers so that the handmade object is serving up handraised nourishment. Events like these could help us reread and rewrite the stories we live by, finding new awareness of the symbolic meanings of food mannerisms and fostering a sense of connectedness. gwendolyn yoppolo uses words, ceramic objects, and food to stretch boundaries and transform perception. She creates sensuous kitchen- and table-wares that use the physical experience of hunger and satiation to address issues of human desire and relationships, and to challenge the ways we nourish ourselves and others within contemporary food culture. She holds an MFA in ceramics from Penn State University, and is currently Assistant Professor of Ceramics at Kutztown University. Her writing is published in Studio Potter, Pottery Making Illustrated, and Passion and Pedagogy. Contact her directly at gyoppolo@gmail.com, and see more of yoppolo's work on Artaxis.org.